You can provide life-transforming fistula surgeries to women, simply by playing a game! 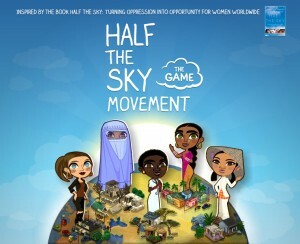 Fistula Foundation is one of seven global nonprofits featured in Half the Sky Movement: The Game, a Facebook adventure that raises awareness and funds to empower women and girls across the globe. Inspired by the worldwide Half the Sky Movement created by Pulitzer Prize winning authors Nicholas Kristof and Sheryl WuDunn, players embark on a journey to complete quests and unlock real-life donations from sponsors that reflect the important issues portrayed in the game. The game takes players like you to five countries – India, Kenya, Vietnam, Afghanistan, and the U.S. – and will share information and real-world work from all of the game’s nonprofit partners, including Fistula Foundation, GEMS, Heifer International, ONE, Room to Read, United Nations Foundation and World Vision. As you play, you’ll complete quests to unlock funds that provide real-world donations to empower women, such as books and life-transforming fistula repair surgeries. For the last decade, Johnson & Johnson has worked with us to provide treatment for women suffering from obstetric fistula. This partnership continues as we work together to elevate awareness of obstetric fistula even further. 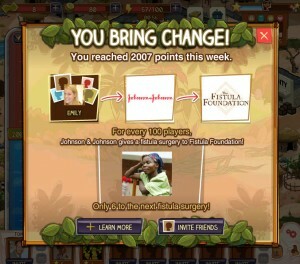 Through Half the Sky Movement: The Game, Johnson & Johnson and the Fistula Foundation enable you to have a direct impact and help women get the real-world fistula surgeries that they need. The game is free, and all you need is a Facebook account in order to play!